Pet At Hand Free will gather in one place and combine important information concerning your pet and its feeding. It will identify and track food intake; daily, weekly and monthly expenditure on consumption. 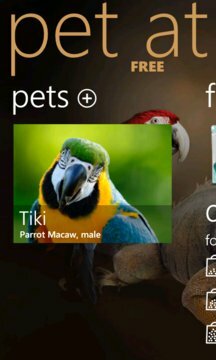 With the program you will able to save basic data of the animal: picture, name, age, species, chip and passport number, other notes. Keep the favourite food details: brand and flavour, pack picture, weight, price, web page (orders, etc. ), special offer and discount if any. 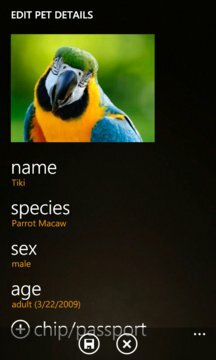 The application was designed and created specifically for the Windows Phone, utilizing its modern graphic and technological solutions. See also our solutions dedicated for cats and dogs.